Voting for the Hagerstown Hot List is Open! Voting for the 2016 Hagerstown Hot List is well underway! Have you placed your vote for Larry & Sons as the best plumbing service in Hagerstown and best heating/air conditioning company in Hagerstown? Last year, we took home the title of “Top Plumbing Company in Hagerstown” thanks to your votes and support. This year, we would like to continue our streak and be named the top heating/air conditioning company. Voting runs from May 1st through June 30th, and we need your help! At Larry & Sons, we pride ourselves on being the best plumbing and heating and air conditioning company in the Hagerstown area. We set ourselves apart from the competition by offering dependable service 24 hours a day, 7 days a week. We guarantee our services and the products we sell and install. From our “no lemon” guarantee to our lifetime replacement guarantee, we stand behind our products and services. We’ve already received more than 1,000 positive reviews on our website, and we would greatly appreciate it if you would share a positive review once again simply by voting for us as the best plumbing and heating/air conditioning company. 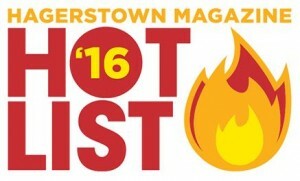 Casting your vote for the 2016 Hagerstown Hot List couldn’t be easier! Just go to https://hagerstownmagazine.wufoo.com/forms/hagerstown-magazine-2016-hotlist/. Once you’re there, you can find the “Plumbing Service” and “Heating/Air Conditioning” categories under “Readers’ Favorites in Businesses.” Enter Larry & Sons in these two categories, and vote for your other favorites in any other categories you’d like. You do not have to fill out the entire ballot, but you do need to vote in at least 10 categories for your ballot to count. When you’re finished, just click “Submit,” and you’re done! From all of us at Larry & Sons, we would like to thank you in advance for your support. The results will be printed in the September/October issue of Hagerstown magazine.